Come experience the splendour of Chikmagalur, the marvel of backwaters in Kabini and nature going wild in Bandipur. Around these areas, there are stunning sculptures, art forms, temples with intricate details created centuries ago. This monsoon, create a lifetime of memories and unravel the scenic surprises present in Karnataka. Come experience the splendour of Chikmagalur, the marvel of backwaters in Kabini and nature going wild in Bandipur. Around these areas, there are stunning sculptures, art forms, temples with intricate details created centuries ago. Coffee Day Hotels & Resorts offers you the holiday of your dreams in the luxurious settings of The Serai. Each property has taken inspiration from its natural surroundings and built a magical world for you to experience the same in all its glory. In Chikmagalur, inspiration has been taken from the lush green coffee plantations. In Bandipur, it is the wild jungle and its inhabitants that have been the muse. In Kabini, it is the ever buzzing water front that plays the hero. At the Serai resorts, every point of your journey keeps you connected with their inspiration, making it an experience like no other. Ride along with the current while the raindrops fall on your head and you soak in aromas of the coffee country of Chikmagalur this monsoon. Enjoy a sweeping view of the idyllic environment while relishing delightful delicacies at Odyssey restaurant or indulge yourself with an exotic spa experience at the Oma Spa. Experience an all new high as you course through the Bhadra River while partaking in the white water rafting adventure. The Serai Kabini, tucked away in the picturesque banks of the river Kabini, gives you your hearts full of pure nature. Filled with varieties of exotic flora and fauna, this resort is the tranquil haven for birdwatchers and wildlife enthusiasts. Built along one of the oldest and most revered national parks in the country, The Serai Bandipur transports you into the wild. Here you get a chance to behold the majestic Indian Tiger and other species of exotic wildlife, all in the lap of rustic but undeniable luxury. Stay for 2 nights at The Serai Chikmagalur: The prices start from Rs. 36,500. 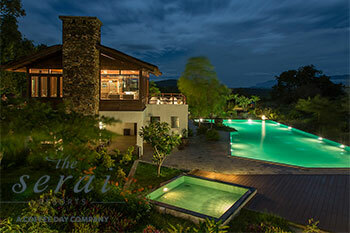 Stay for 2 nights at The Serai Bandipur: The prices start from Rs. 31,500.